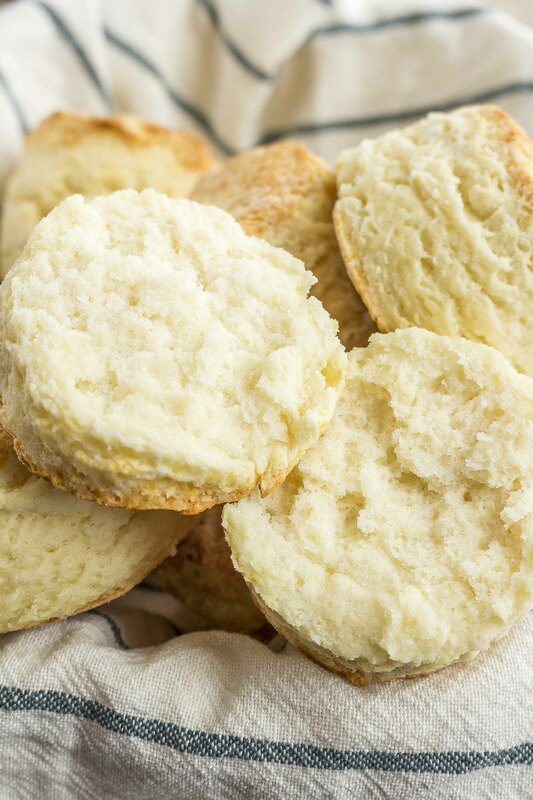 Gluten Free Biscuits - Tender, Light, Flaky, and easy to make! 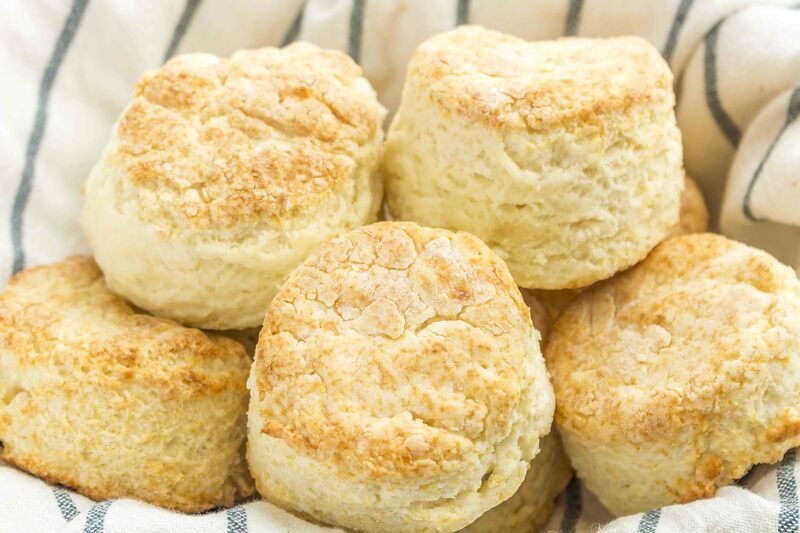 Tender, light, and flaky gluten free biscuits have a secret ingredient that also makes this recipe unbelievably easy. They’ll have everyone asking if they’re “really” gluten free! This post contains affiliate links, so please see full disclosure. 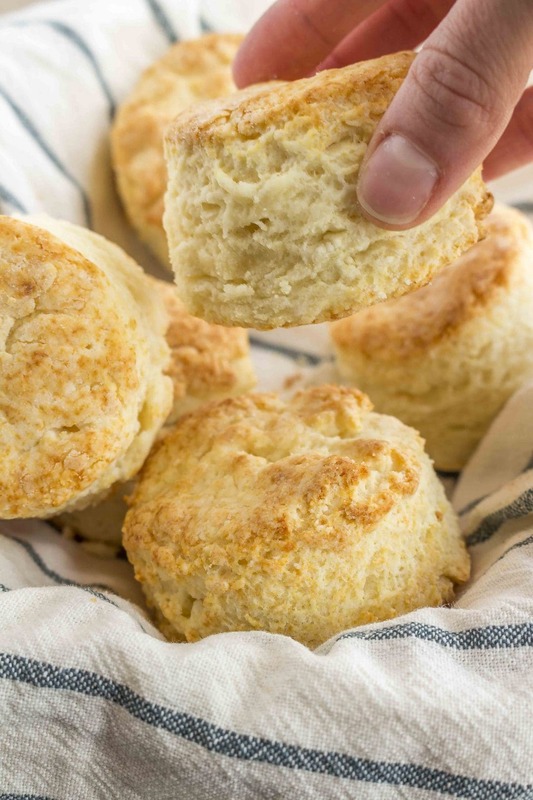 Your search for the perfect gluten free biscuits is over. I know that sounds like a tall order, but I promise you these biscuits don’t disappoint! Keep on reading to see why. 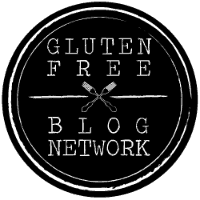 When we began eating gluten free 4 6 years ago, I was making 2 batches of everything: one gluten free, and one with regular wheat flour (anyone been there, done that?) 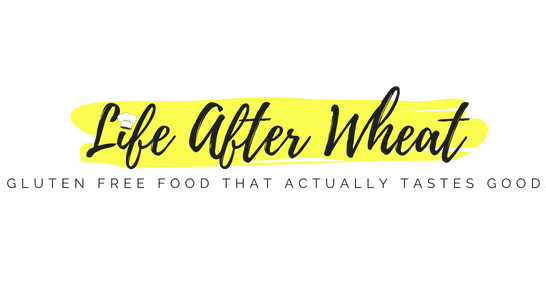 After a while I realized that just wouldn’t work because it was time consuming and too hard to avoid cross contamination with wheat flour in the house. We tried many a biscuit recipe, and many a variation, before coming up with this one. There are a lot of gluten free biscuit recipes that are just like regular biscuit recipes and we just didn’t feel like they turned out quite the same. 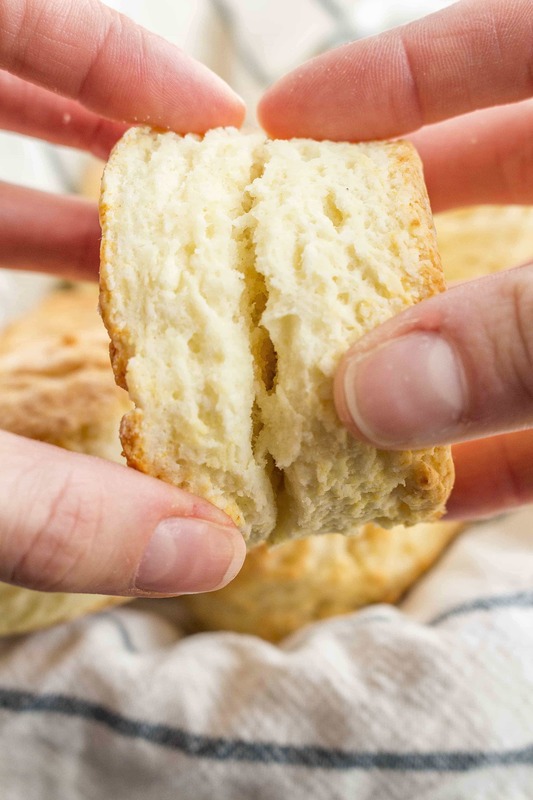 We were looking for a biscuit that, in addition to being gluten free, was also tender, light and flaky – without a gritty texture and dense structure.The secret to making gluten free biscuits without a grainy texture is (shhh! don’t tell) melting the butter. That means you whisk up the wet ingredients, add the dry, mix it all together with a fork, fold over a few times, cut, and bake. Easy peasy, right? Here’s another secret step: You’ll notice the dough will still be fairly sticky, as you can see below. Keeping the dough sticky and coating it in flour keeps the gluten free biscuits soft and tender instead of hard and grainy. I use the same technique with my crescent rolls. 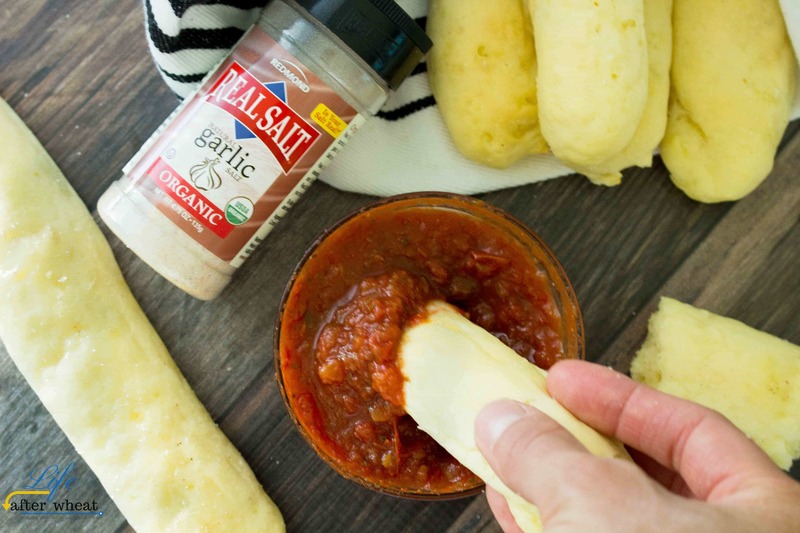 You might be asking, Which gluten free flours work well with this recipe? Well, we’re glad you asked! 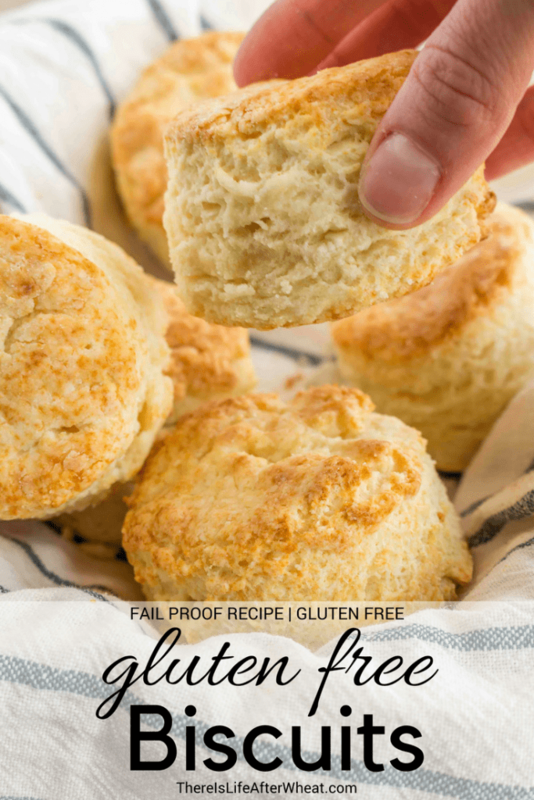 😉 Because Gluten free biscuits are very delicate and require just the right flour, We strongly recommend using Gluten Free Mama’s Almond Blend or Cup4Cup. We realize you may or may not have these in your pantry, but it’s worth the extra effort and cost of keeping a bag on hand for those times when you want a truly good gluten free biscuit! While GF Jules and Better Batter are fantastic flour blends for most recipes, their higher starch content doesn’t work well in this recipe. We have also tested this recipe with Bob’s Red Mill and Grandpa’s Kitchen, and while we also love these and use them in other recipes, they don’t work with this particular recipe. Tender, light, and flaky gluten free biscuits have a secret ingredient that also makes this recipe unbelievably easy. They'll have everyone asking if they're "really" gluten free! 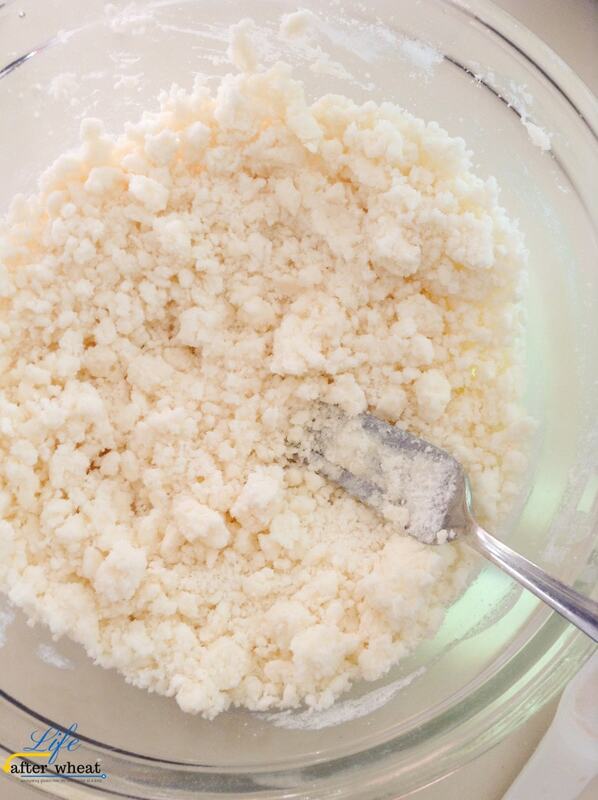 Melt 1/3 cup butter in a medium bowl in the microwave. Begin with 10 seconds, remove and stir. Butter should be barely melted. Whisk sour cream and sugar into melted butter until smooth. Add flour, baking powder, baking soda, salt and cream of tartar and stir with a fork until mixture resembles coarse crumbs. Add sparkling water and stir until mixture comes together. It should be fairly sticky. Lightly flour counter top with about 2 tablespoons more flour mix and turn dough onto counter, turning to fully coat. Be careful not to mix the flour into the dough. Flatten with your hands into a circle about 3/4" thick. Fold in half to form a half circle, then in half again to form a triangular shape, and pat to 3/4" thickness again. Repeat the last step. This folding is what creates the flaky, layered effect. Cut into circles with biscuit cutter or large cup and arrange in a round cake pan so the biscuits are so close they are almost touching. When oven is preheated, bake biscuits for 7-10 minutes. Remove biscuits just as edges begin to turn a golden brown and be sure not to overcook or they won't turn out so flaky and soft. Pry biscuit in half horizontally with a fork to see if it's done. These are best served warm. Store any leftovers (if you happen to have any!) in a sealed bag at room temp for up to 2 days. You can also freeze. To reheat, wrap in foil and place in 300° oven about 5-10 minutes, or microwave individual biscuits about 25 seconds on 50% power. I've also made a double batch and wrapped half the cooled biscuits in foil to store in the freezer. These look SO PERFECT! And I can’t believe you were able to get that flakey texture using melted butter. These really are miracle biscuits! 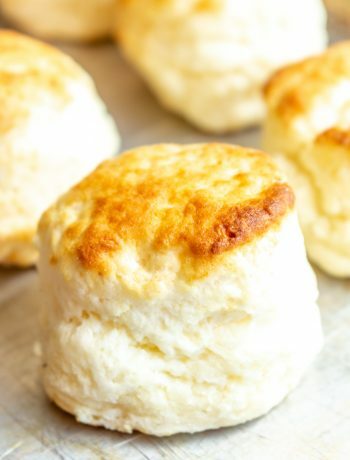 I’ve been craving biscuits this whole pregnancy and haven’t gotten around to making a batch yet, but that is going to change ASAP! Recipe looks great – one thing that catches my eye is the fact that there is very little added sugar. Yay! We are a biscuit loving family too, so these will be a delicious new treat. They sure do look perfect!! No one would ever know what they’re “missing”! Thanks Rebecca! And yes, we’ve served these to many a gluten-eater and they all agree! These really do look good, Celeste. I’m definitely pinning these. One question. Which flour would be your second choice? My daughter seems to be allergic to almonds and I’d really like to try these. 🙁 Thanks. Hi Barbara! Thats tricky, but I would try Cup4Cup. Please let me know if that works so I can pass it on to other readers who have nut allergies. Thanks for stopping by! Hi, I know in pie crusts, etc to use ice cold water. Do you use/recommend using cold soda water? Can’t wait to make these, thanks! I just use room temp. Excited for you to try them! We’d love to try making these for tomorrow and were wondering if coconut cream might work for the sour cream? We use it in dips and things like that were we are converting from sourcream to dairy free but I wasn’t sure if it would work in this. I think that’s a great idea, Angie! I’ve never tried it so can’t guarantee anything, but please let me know how it turns out and I’m anxious to give it a show next time I make these. Hi Celeste. I finally got around to making your biscuits. Sooo yummy. Honestly, I can’t remember what gluten filled biscuits were like but these were so good! I used a homemade gf flour mix since I’m allergic to rice. I’m can’t remember where I got the recipe though. It’s millet, sorghum, white buckwheat, teff, and tapioca starch. They were on the darker side with the teff flour and I think it gave them a really good flavor. I’ve ordered some white teff so will see what that does to it. But regardless, they were tasty! Thank you for the recipe. Fabulous recipe! I love how unfussy it is, that’s the thing I hate the most about biscuits. I didn’t have the almond blend, but I used 1 1/4 c. King Arthur gf blend and 1/4 c. Wellbee’s almond flour. I also added 1/2 tsp of psyllium in addition to the xanthan& used Greek yogurt instead of the sour cream. I hate rolling out and cutting the biscuits so I always form the dough into a rectangle & use a knife to cut it into 6 equal pieces. So much easier. Thanks again for a great recipe! Thanks. Celeste for helping me out. I’d feel lost without some recipes. So, using your flour recipe wouldn´t work? I live in Spain and can’t get any of the flours you mentioned. Not even something similar to that. Thanks for the prompt response. Will try them this way and let you know how they come out. I had terrible results with Better Batter. The inside stayed doughy despite baking them for almost 3x the suggested time. I’d like to try the flours you suggested but they are expensive. I’ll keep trying. I tried this recipe and it worked very well. The biscuits were light and flaky and tasted so good. I used my own flour blend as I am diabetic and the rice flours send my blood glucose to the moon. My blend uses teff flour, oat flour, blanched almond flour, almond meal, tapioca flour (starch), and corn starch and I add the xanthan gum when blending. I use this as a cup for cup flour and it works well. The biscuits have more the look of whole wheat flour, but are still light and flaky. I am willing to share the flour blend with others. My husband is wheat intolerant and I am diabetic, makes for a fun time when baking. 1. Combine all ingredients together and make sure they are mixed well. Store in an airtight container and use as flour in any baking recipe. **** Just a note that biscuits made with this flour will have more the texture and look of a whole wheat flour. I haven’t tried Namaste with this recipe, I think it might be too heavy of a flour. If you decide to try it, I suggest using 1/4 cup less flour to start and adding more if needed as Namaste tends to soak up more moisture. Those biscuits are marvelous. They taste the same as the gluten-filled ones I remember my mom making. For those who are making them for the first time, I suggest you cut into the dough when the thickness of the dough is thicker than you think it should be. 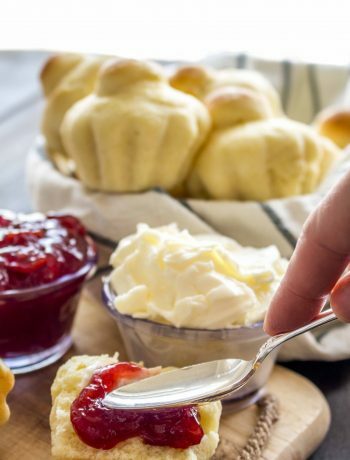 They won’t rise enough (or at all, really) during the baking process, so the thickness you want your biscuits to be will be the thickness of the dough you’re cutting into. Thanks Deborah, so glad you enjoyed them! I would like to try them but I also need to make them dairy free. Does anyone have experience using earth balance as butter replacement? What do you use as sour cream replacement? You just made my day! Thank you for the link. I will try them and add them to my Christmas meal plan. My children will be so excited! You recommend the Cup4Cup flour for the dairy free option as well. I will have to find that since our stores seems to stop carrying it. Not Cup4Cup, it has dairy. See if you can find Better Batter in time for Christmas, that yields the BEST results and you should be able to get it on Amazon if you have Prime. If you can’t get a hold of some, you can use King Arthur GF flour but swap 1/4 cup of flour for tapioca starch or corn starch. Can this recipe be used as drop biscuits to top a chicken pot pie? Have you used butter milk instead of sour cream. This is the recipe I wanted to use the drop biscuit on. I was worried about the bake time for the biscuits. The pot pie recipe bakes for 35- 45 min. at 375 temp. Your biscuit recipe bakes at 425 temp for 7-10 min. and is noted not to over bake. I was going to try the drop biscuit method that is in the pot pie recipe- I like how they spread to cover the whole pie filling. These biscuits are amazing! My DH said they were the best he has ever had! Thank you so much Karen, I’m so glad you enjoyed them! Absolutely amazing. I made the biscuits and gravy for our church Easter Brunch. We have a group of members who always miss out on biscuits and gravy, but not this year. Received rave reviews and several have asked for the recipe. Thank you SO much, I was so happy to be able to make sure they enjoyed every bit of our celebration brunch. I made the biscuits the day before an then warmed them up slowly in a warming oven. The gravy I just served in a crock pot. So easy. I’ll be checking out your other recipes for our next potluck. Wonderful Carrie, so glad everyone enjoyed them!! !